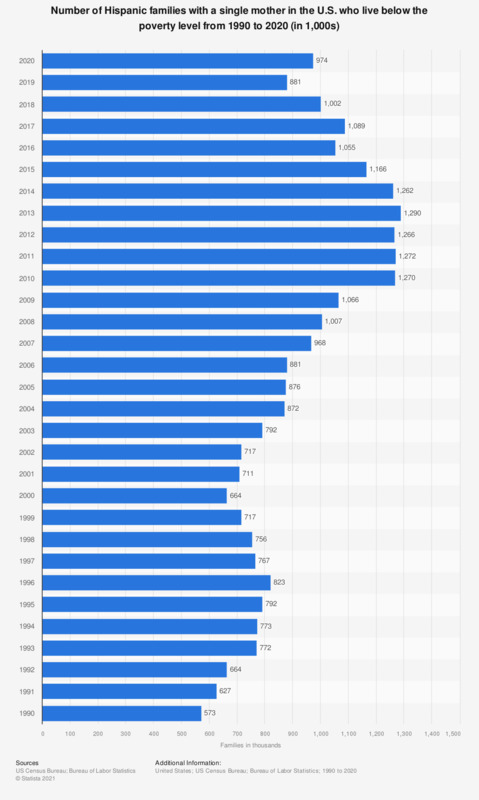 This statistic shows the number of Hispanic families with a female householder and no husband present in the U.S. who live below the poverty level from 1990 to 2017. Hispanics can be of any race. In 1990, about 0.57 million Hispanic families with a single mother in the U.S. lived below the poverty level. Poverty is the state of one who lacks a certain amount of material possessions or money. Absolute poverty or destitution is inability to afford basic human needs, which commonly includes clean and fresh water, nutrition, health care, education, clothing and shelter. Female householder, no husband present - with and without children under 18 years.